Lachie Whitfield has had a dominate game today with 33 disposals at a disposal efficiency of 85 percent, 15 handball receives, nine scoring involvements and 524 metres gained. Mitch Robinson has had a strong game today with 28 disposals at a disposal efficiency of 79 percent, equal career-high 20 contested possessions, nine clearances, six inside 50's and six scoring involvements. GWS have been strong when the ball has been on the ground, leading groundball gets 84 to 71. Matt de Boer 9, Tim Taranto 8 and Adam Tomlinson 7 have lead the way for the Giants tonight. Brisbanes Harris Andrew has played 98 per cent of the game this evening, the most out of everyone on the field. Heath Shaw for GWS has spent 97 per cent. Lions InterchangeJarrod Berry off due to an injury. GWS have dominated territory this quarter with 75 per cent spent in their forward half of the field. They have failed to capitalise on the scoreboard only scoring 1.3 (9). GWS has focused on Jeremy Cameron as its key target inside 50 this afternoon, targeting him a teamhigh five times. He has failed to heavily impact the scoreboard with only one goal but has nine scoring involvements. GWS total of short kicks this evening so far of 100 exceeds their season average of 92.4, they are ranked 4th across the season. Brisbane 3.3 (21) has outscored GWS 2.2 (14) this quarter. Dayne Beams 10, Jarrod Berry 9 and Mitch Robinson 8 disposals are leading the fight back. Daniel Rich has gained 417 metres for the match, with Lachie Whitfield 406 and Dayne Beams 400 the next best on the ground. GWS has been able to hit the scoreboard from stoppages today outscoring Brisbane, 3.1 (19)0.2 (2) from this area. Stef Martin has won the hitouts 162 when he has been opposed to Adam Tomlinson in the ruck and 7 hitouts to advantage. He has been excellent around stoppages with three first possessions and two clearances. GWS forward pressure has been far better than Brisbane's, applying 21 tackles to 11 inside in the forward half of the ground. GWS disposal efficiency of 76 per cent is higher than their seasonaverage of 73.5, they are ranked 7th across the season. Callan Ward has had a quiet night with seasonlow disposals to halftime with only six. He has been effective with his disposals with 83 per cent efficiency and 119 metres gained. 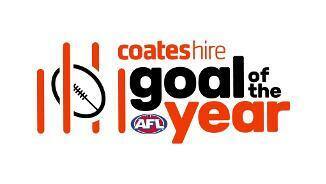 GWS has kicked six out of the last seven goals of the match to take the lead out to a gamehigh 33 points. 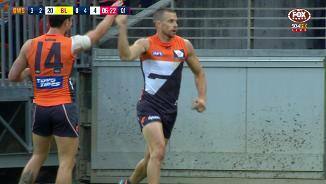 Despite losing the hitouts 422, GWS are winning the clearances 17 -11 with Tim Taranto and Adam Tomlinson having three each. Mitch Robinson has had strong first half with a gamehigh 13 contested possessions. This is a season-high surpassing his previous best for a match, 12 against Port Adelaide in Round 3. Giants InterchangeZac Langdon and is possibly out for the game. Stephen Coniglio has had a strong second quarter tonight with nine disposals, four handball receives, three contested possessions, two clearances and 157 metres gained. GWS has dominated the clearances 71 this quarter. Zac Langdon and Stephen Coniglio are leading the way with two each. 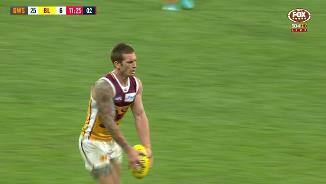 Dayne Beams kicks the Lions first goal of the match and his first of the season. He has kicked 150 goals from his 152 games across his career. GWS have 43 more effective disposals than Brisbane for the match so far. Brett Deledio (13), Dylan Shiel (11) and Stephen Coniglio (11) have been the most prominent on the ground. Brisbane has been inaccurate in front of goal this evening scoring 0.5, it ranks 16th in the competition for scoring accuracy this season with 49.0 per cent. Matt de Boer has had a strong first quarter tonight with 14 disposals, five handball receives, five contested possessions, two clearances and two rebound 50s. Stef Martin has won the hitouts 80 when he has been opposed to the GWS ruckmen this quarter - Adam Tomlinson (5-0) and Jonathon Patton (3-0). The two sides have been evenly matched in the clearances with GWS holding a slight advantage 54 this quarter with Tim Taranto leading the way for GWS with four first possessions and two clearances. Giants InterchangeAidan Corr off due to an injury. Brisbane has had the past seven inside 50's in the match. It has had 11 more disposals in the forward half than GWS but has failed to capitalise scoring only two behinds for the quarter. GWS lead the contested possession count by six for the quarter. Tim Taranto has been influential early with three contested possessions. Stefan Martin has averaged 31 hitouts and 4.5 clearances per game across his career against the Giants his secondhighest amounts averaged against any side. Greater Western Sydney has averaged 11 more contested possessions per game than its opposition this season ranked third. Dylan Shiel has averaged 28.4 disposals per game against Brisbane across his career his highest amount averaged against any side. The Lions have averaged 33 points from their clearances this season the fourthmost recorded by any side. Welcome to Spotless Stadium for the GWS Giants v Brisbane Lions Round 6 clash. 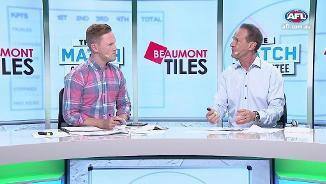 GREATER Western Sydney has consolidated its position among the early frontrunners, with a 34-point win over Brisbane in a match in which both teams kicked poorly. GWS never trailed at any stage on Saturday night but neither did it look like tearing apart the winless Lions, and the home team recorded a 10.17 (77) to 5.13 (43) victory at Spotless Stadium. Hard-working Matt de Boer tallied a career-best 34 touches for GWS, who were also well served by fellow veterans Brett Deledio and Ryan Griffen, plus Lachie Whitfield, Tim Taranto and Stephen Coniglio. Brisbane couldn't get anything going offensively in the first half, kicking just 1.6. 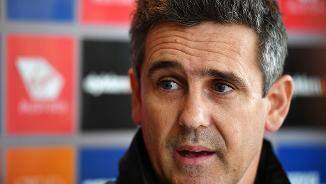 GWS coach Leon Cameron sang de Boer's praises after the victory. De Boer joined the Giants last season after crossing from the Dockers, and was perceived by many to be a depth player at his new club. "It's a great story because at 26 or 27 years old sometimes you think when you move from one club to another you mightn't be able to keep improving," he said. "But he's actually probably in his prime. He's actually improving every week. I'm rapt for him and I think the whole club is rapt for him because he's always had to do it hard." The Lions enjoyed a 47-4 advantage in the hit-outs, with Stefan Martin dominating against makeshift ruckmen Jon Patton and Adam Tomlinson, but GWS largely controlled the game at ground level. With goals from Zac Langdon, Jeremy Cameron and Deledio, GWS carved out a 17-point lead at the first break. 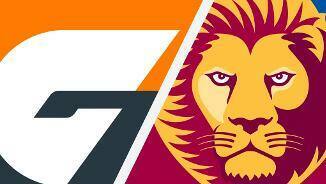 The Lions' first six shots were behinds and they didn't post a goal until 11 minutes into the second quarter when captain and leading possession-getter Dayne Beams landed a long-distance set shot after taking a courageous diving mark. GWS hit back with majors to Daniel Lloyd, Adam Tomlinson and de Boer to lead by 33 points at half-time. It took the Lions less than two minutes of the third quarter to kick a goal, but GWS kicked the next two majors to establish a match-high advantage of 39 points. Brisbane booted the last two goals of the term, including a 60m-plus bomb from an otherwise quiet Eric Hipwood, to trail by 26 at the last change and couldn't reduce the deficit in the last quarter. 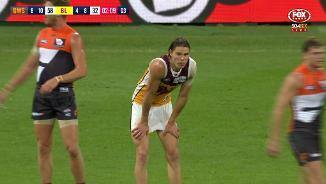 Langdon came off in the second quarter with a knee injury, while Brisbane's Nick Robertson was placed on report. 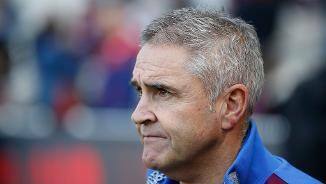 Lions coach Chris Fagan took plenty of positives out of the defeat but lamented his side's first-quarter inaccuracy. They kicked 0.5. 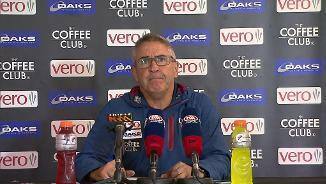 "Then they kicked three goals in red time in the second quarter, and there's the game," he said. "That seems to be all it takes with our emerging group. 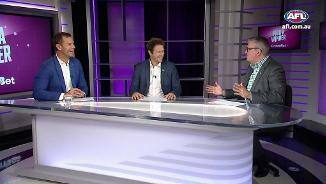 They just find little ways against good teams to lose." WATCH: How's this from Hipwood? 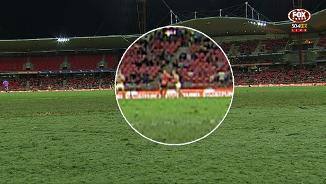 Greater Western Sydney: First-year player Zac Langdon injured his right knee in the second term and played no further part in the clash, while Aidan Corr was taken to the rooms clutching his shoulder in the first quarter but returned to the field. Brisbane Lions: Jarrod Berry limped off with an ankle injury midway through the last quarter after a heavy tackle on the wing. Dayne Beams copped a head knock in the second term but did not appear to be affected. 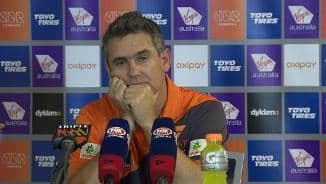 The Giants have a six-day break ahead of a tough away clash against a rebounding Geelong on Friday night at GMHBA Stadium, while Brisbane return to the Gabba for a Sunday twilight match against Collingwood.